Alive In Africa: Do you have some time to change the world? I was meeting with a couple of pastors on during my small group where we are discussing the book Spiritual Leadership. I teach three days a week – Monday, Wednesday and Friday for an hour and half. In addition to this, I meet with a small group of pastors every Wednesday as well. After the small group was over, I asked the pastors how the ministry was going. The pastors, Pastor Jere and Pastor Pihri shared how much they were being impacted by Action Bible Institute. It is not uncommon for Zambian to be generally flattering, especially when they want something and often this includes pastors. We have learned to take it all with a grain of salt. But, these two pastors are seasoned and experienced pastors who have planted and pastored church in Lusaka for many, many years. They are not the flattering kind, so it took me back a bit. So I asked them a question that could have been seen as fishing for compliments. But, they wasted no time sharing their appreciation for our school, as if they were just waiting for an opportunity to answer. Pastor Jere spoke up and said, “I attended a 3 year theology a number of years ago and I have learned more in this four month with you than I learned in all three years there.” I was a bit astounded by that comment and I said, “Why? How is our school different?” He said, “What I learn here I can immediately teach to my people. You help us train our people. You help us disciple our church. Other schools just teach us, but you train us to train others.” This is significant to hear because in Africa, when you get knowledge, you hold onto it. Knowledge is power, literally, and it positions you to have an advantage over others. Whether in churches, the medical field or many other fields, knowledge is not freely shared in a mentoring way. But, we have made this one of our key distinctives, in that we train pastors so they can train others. So, Pastor Jere then went on to explain how this idea of training others was true in his life. 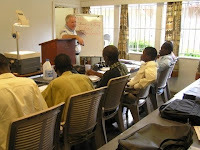 The past three months, he was taught the first module of a Veritas College inductive bible study material. He was taught it by Tracy Singelton and then he was taught how to facilitate this class. He is now leading a small group of 10 pastors and leaders through this study every Saturday. In addition, he shared a practical example about a lesson I taught on the previous Friday. One of the ways I approach my teaching is that I try to teach them how to do an inductive bible study of the passage, helping them understand how to study the passage. And then I try to explain what the passage means theologically, or at least explain the contrasting views that others have in regards to the passage of scripture. The last and most important step is to help them think through the passage in light of their own culture. I ask a lot of questions about this step because I want to learn more about their culture, but it also challenges them to really think through the culture and how these principles may change how they may need to live. So, this last Friday, I was speaking on Ephes. 4:27-28 - He who has been stealing must steal no longer, but must work, doing something useful with his own hands, that he may have something to share with those in need. In this Africa culture they have a saying, “You eat where you work” which means that you are free to take anything you need or want at the place you work . This reflects a culture where stealing is justified and looked over in such ways that even Christians steal. So, knowing this cultural issue, I talked through the verse, explained it theologically and then dove into the cultural aspect of this verse. It got really quiet. But, I didn’t know the impact of that teaching until Wednesday when Pastor Jere and Pastor Phiri shared how he used this lesson in a Bible study earlier in the week where they confronted the cultural norms with the Word of God. They described how as the Word convicted these people, they began crying and laughing (I think in just disbelief) in response to how they had lived in such sin. They had never really seen that verse before. This is just one small example of how God is practically using Action Bible Institute to help disciple pastors to disciple their church. Pastor Phiri also shared with me how he appreciated our church. He spoke of the emphasis on humility and servant leadership. He had never known a school that focuses so much on how to the way to effective leadership is through servant humility. He shared how the churches in Africa are focused on power and authority and being the “the big man.” He shared an example of how he is planting a church right now and he is meeting with a small leadership team. He is training this team in these same principles of what being a leader of church means and how to model the example of Jesus Christ that we are focusing on as Bible School. And there are more stories. Pastor Peter Zulu was sharing with me how he had a dream one night where he was listening to a pastor at a conference teach from a verse and he took it out of context. Pastor Zulu, in his dream, began challenging this man, showing him he took the verse out of the context from which it was originally intended. This is one of our biggest teaching principles and where we spend a lot of time emphasizing the importance of interpreting a passage in the context for which it was intended. Like many churches and cults in America, this is also a problem in Africa as well and not only are they learning this principle which we interweave through many classes, I guess they also dream about it as well. And, Pastor Joseph Zulu was sharing how he was using the teachings from our Bible Institute in his religion class that he teaches at private school for adults. In his class are Muslims who argue with him about his views on Jesus and yet he continues on. He shared how one student even said, “Are you a pastor? Where do you pastor? I want to come to your church because I have never heard anyone teach the Bible like you are doing in this class.” That is encouraging to hear about that. I’ll never forget the day when I first heard the Word of God taught in a way that was biblical and cultural. It is exciting to see this excitement and newness being reproduced. I am at this time mostly focused on teaching in Action Bible Institute. But, we also have pastors involved in a one year program where they are going through the Navigators 2:7 course. They have three books that build on each other, and the pastors are currently on book two. They meet every Thursday to study and learn together. But they are also now teaching book one to people in their churches. So, they meet twice a week , Tuesdays and Thursdays, with Action missionary Graham Melville to on Tuesday, get help in how to teach the courses and then on Thursday to go through book two. Each pastor and leader in the class has classes up and running with around 90 people who are now going through the 2:7 class in a variety of different churches. They are thrilled by what they have learned and the response they are receiving from leading this class. 1. To teach Pastors to be disciple makers of their leaders and their churches. 3. To teach the context of the Word of God so that pastor lives and teaches a biblical Christianity and not a cultural Christianity, which is teaching them the centrality of God and the gospel in every part of their lives. → Church-based—focused on building up existing local churches, not planting new ones. → Vision-cultivating—helping churches be self-sustaining & fulfill their own vision, not ours. → Gospel-focused—wholistic in activities, but always rooted in the centrality of the Gospel. The Pastoral Leadership Development team of AZ exists to strengthen leaders in local churches, equipping them for the work of ministry in the areas of discipleship & evangelism, leadership, and theological education. PLD focuses on the roots & the trunk of the tree, but always with branches and fruit in mind. I share all of this for two reasons. It is exciting what God is doing in Zambia. And second, we cannot do this ministry all by ourselves . We need people who will be partner with us as we teach a generation of pastors. 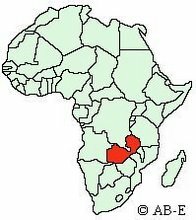 We as missionaries have raised money to be able to come and minister in Zambia. But, there is no one to support these pastors during these short but important and formative years. The goal of our ministry is sustainability, not dependence. We want to help Zambians help themselves with solutions and programs that they initiate and maintain. We need some people to come alongside us to sponsor these workers while they are trained and equipped. It is seldom possible for these pastors and leaders to adequately support their families while going to school, working, and pastoring. So, we are starting a sponsorship program for the 27 students that will provide them with tuition-free training, transportation and food for their families so they are able to focus on the study of God’s word. We are looking for those who could sponsor an Action Bible Institute for three years at $55 a month. We are also looking for those who could sponsor those in our discipleship school for one year at $45 a month. (For more information on how we break down the costs, please see attached forms.) As of now, we have 6 students that are covered, and we are looking for 21 more. Could that be you? What will you get in response for your donation? We will send twice a year updates about the student you choose to support and you will also receive pictures of the families and communities who are being impacted by the student you are supporting. You will also have a private website blog set up just for you to see videos and pictures and messages from your sponsored student sharing how this training is impacting their lives and ministries. For an example, go to this site: www.brucekaumba.blogspot.com. This could be a perfect Sunday School project or some families could go in together… We would appreciate any sacrifice you could make. Thanks for partnering with us!